We recently passed an Internet milestone: April 12 marked the 20-year anniversary of commercialized spam. But even with two decades and trillions of unsolicited messages behind us, it seems there is still no end in sight. There were certainly unsolicited messages sent before April 11, 1994, but that's the day two lawyers pitched a green card lottery to the vast Usenet News audience. It's been mostly downhill since. You've probably been emailed by your fair share of African "royalty" or other foreign nationals seeking your assistance in transferring millions of dollars of wealth to the United States. Perhaps you've received email ads for Viagra or unsolicited pitches to for a low-interest mortgage or other loan. 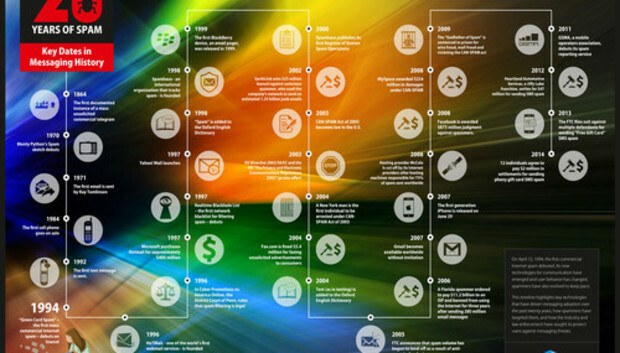 Cloudmark wrote a blog post and created an infographic looking back at key dates in the 20-year history of spam. That first blast on Usenet News was nothing. Internet service providers, businesses, and individuals have invested millions and wasted countless hours in the battle against spam. According to Kaspersky Lab, spam still makes up nearly 70 percent of all email sent. That means, roughly speaking, that if you were to receive 100 emails today, there's a good chance that 70 of them will be unwanted solicitations. The scourge of spam has pushed users to seek alternative forms of communication, and the spammers have followed along. Instant messaging, social networking, SMS text messages--if there are millions, or even tens of thousands, of people utilizing a given form of communication, you can bet there are spammers working to exploit it. The good news is that things actually have improved dramatically on the email side. While 70 percent of all email might be spam, webmail services and email servers have greatly improved the ability to identify and block those messages before they get in the door. Most email client software also has very good junkmail filtering capabilities. The result is that only a handful of the spam messages intended for you ever actually make it to your inbox. Unfortunately, the tech world is still trying to catch up to newer spam attacks on social networks and text messaging. Depending on the platform or service, there are some controls to prevent unsolicited messages, but the onus is on the user to be aware of and configure those security features in most cases. But the best defense against spam is the human using the technology. The only reason spam continues to be an epidemic is because it works. It costs virtually nothing to put a spam message in front of millions of users, so any response at all is profitable. You are your own best protection: don't open file attachments, and don't click on links. Better yet, just delete unsolicited messages without even opening them. If enough of us do this, maybe we can stick a fork in spam once and for all.